Today is the day of the astronomical Vishu, the vernal equinox. Which means the sun rises exactly in the East, and day and night have equal lengths. It is one of the four important corners of the Year. A day of celebrations and blessings. Viṣhu-vat, t, n. (probably formed fr. viṣhu + rat), ‘possessing a separation into two equal parts, the point of equal separation, i. e. the equinoctial point or equinox; the central day in a Sattra or sacrificial session. In the Georgian Calendar it is the 20th of March, and equinox day always falls on the 20th the 21st or the 22 of March. Because that calendar was designed to keep equinox fixed on the same date. This is done by way of the leap days inserted every four years at the end of February. In the Northern hemisphere it marks the start of Spring. For many people in the world it is their New Year. For instance the Persians and the Kurds. 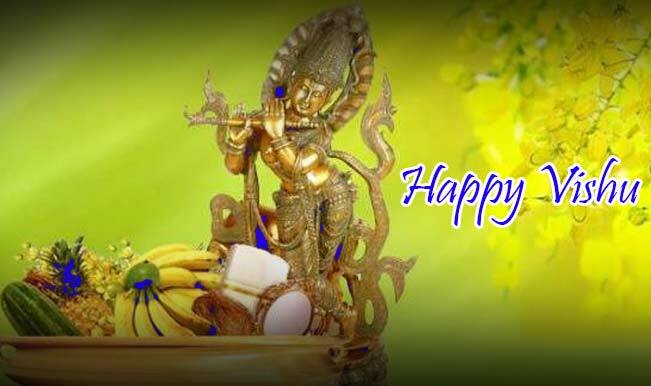 The astrological Vishu will be celebrated in India on the 14th of April, when many parts of India celebrate New Year. For instance the Tamil and the Malayalam people. In the South Indian calendar it is the moment when the Sun enters the constellation Mesha or Aries on his yearly path through the sky. Why is there this difference between the astronomical Equinox and the astrological Vishu celebrations in India? This is because of the precession of the equinoxes. Earth’s precession was historically called the precession of the equinoxes, because the equinoxes moved westward along the ecliptic relative to the fixed stars, opposite to the yearly motion of the Sun along the ecliptic. The equinox shifts westwards with a speed of approximately 1 degree every 72 years. In Sanskrit this is called Ayanamśa. Ayanamśa (Sanskrit ayanāṃśa: ayana “movement” + aṃśa “component”), also ayanabhāga (Sk. bhāga “portion”), is the Sanskrit term in Indian astronomy for the amount of precession. In astrology, this is the longitudinal difference between the Tropical (Sāyana) and Sidereal (Nirayana) zodiacs. We can actually deduce when the Vishu was fixed on the Samkranta or transit of the Sun into the constellation Mesha or Aries. Because we know the ayanamsha is about 72 years for 1 degree. And the difference between the Indian sidereal zodiac and the Tropical zodiac is today a little over 24 degrees. We can calculate that this was done around 1728 years ago, when the ancient calendars were restructured to reflect the astronomical reality of that moment in time. For me today where I am it is physically equinox, as it is for the whole planet. But the various calendars have different ways of solving the effects of precession. These fascinate me. They all reflect humanity’s knowledge and wisdom in the past. Where ever you are, and however you celebrate, I wish you Happy Vishu-Equinox Day. Very nice explanation of Visuvat and Ayanāṃśa. Can you check the references of Baisakhi too?